Whether at D1, as a Florist, or for His Family, He Strives to be the Best He can be! Hello all, this is Youichi Imamura and this is my 5th year competing in the D1 Grand Prix. You may have seen me most often in car magazines or in the D1 series but today I'm going to write a little about myself as a person. I would like to just talk about my personal life like how I talk to people in a regular manner. When people think of my image, they most often think about me in a race suit because that's all I wear when I get exposure. But during the times that I'm away from the race scene, I work as a florist. Ever since I was a little kid, my parents have owned a flower shop and I have been helping them all my life. My future profession had been decided upon for a long time. After graduating from high school, I enrolled myself into college, where I studied floral botany as well as color coordinating. It was very difficult achieving the national credentials for this, but since it was something that I was interested in, overall it was a fun experience. So I make my living these days as a florist. Ever week, my wife and I drive our van to go gather up our stock. Since I like driving cars, I really look forward to doing this every week. I don't drift the van since we have our valuable stock sitting inside, but it sure gets me excited at times. When I can't go gather flowers because of D1 or a magazine shoot, I rely on the internet. This is how I balance my professional racing career and being a florist. People tend to hate what they do for a living. I'm really fortunate because I am able to completely isolate my racing career and being a florist. This way, I can devote 100% of myself to either job that I'm doing at the time. That's one good trait that I have analyzed about myself. When I'm working as a florist, my brain thinks nothing other than flowers. Like, "what flowers should I stock up on next week?" or "what kind of color coordinating should I do to display these?". I enjoy thinking about these things, and very proud to be a florist. I may have an image of the heavy drifter but in reality, my wedding floral arrangements are second to none. I may look this way, but my flower skills are pretty good. On my days off I spend time with my family. A lot of the times I'm away doing stuff for D1 and various magazines so I try to make it so that on my days off, I spend it with my family. So now I spend time with my son going out and collecting bugs, watching fireworks, or having a barbeque with a bunch of friends. My wife and I enjoy doing activities with children since it takes us back to our childhood. Recently for the first time in my life I purchased a brand new motorcycle. I told my wife that I bought it because I need it to take my son to the mountains to go gather insects! (laughs) The motorcycle is a Honda Ape100. I chose it because I like the simple design. And in the past, whenever I buy a car or motorcycle I usually end up modifying the thing. So I'm trying not to come across Ape100 parts for the time being. 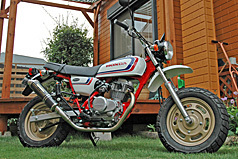 But I kind of like the simplicity of this bike, so I come to a conclusion that it's okay to stay stock. When I was younger, my cars and bikes were always really loud, causing trouble for my neighbors. At times, there would be a cop car waiting for me behind the corner in the weekends. After becoming exposed to D1 and getting my name out there, my neighbors are now very supportive of my lifestyle. I will try to keep my new motorcycle as stock as possible since I need it to take my son around anyways. I want to keep on drifting as long as I am able to. My number one hobby is cars, so rather than to try and enjoy it, I want to continue with my drifting career naturally enjoying driving. As a D1 driver, I will do my best in drifting but at the same time will provide equal commitment to being a florist. And on the days off, I will play hard. Everything I do, I will strive to be the best that I can be. That is my style. 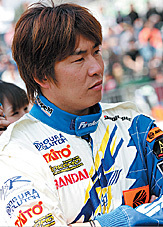 Youichi Imamura won the D1 series championship in 2003 with the Apex FD3S. 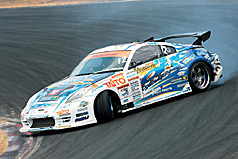 Since Apex's retirement from D1, Imamura had switched over to ORC where he currently pilots their Z33. His daily grind is here, a florist called SILKY HOUSE in the Yamanashi Prefecture. At times, many fans come flocking to this flower shop looking for the famous D1 driver but unfortunately there, they will only find the florist version of Youichi Imamura. He states "I'm very honored that they come looking for me, but I would like to keep my racing career at the race tracks only." At the flower shop, Youichi can be seen arranging flowers according to the season and colors. It is a sight that the public may never even dream of seeing. However, this is the real Youichi.